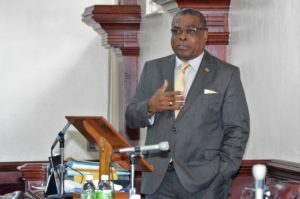 Basseterre, St. Kitts, February 14, 2018 (SKNIS): Minister of Public Infrastructure, Honourable Ian ‘Patches’ Liburd, has apologised to water consumers in St.. Peters, New Road, Pine Gardens, Gillard’s and Shadwell who are affected by a shortage of water supply due to a malfunctioning pump at the area’s supply well. Low water pressure was observed in some areas late last week and technicians from the Water Services Department (WSD) have been working to correct the problem. To minimise the possibility of service interruption to consumers, the WSD initiated a two-week water rationing system on Monday ((February 12). The rationing takes place between the hours of 10 p.m. to 5 a.m.
“Mr. Speaker, I think it is imperative that I apologise on behalf of the department and the ministry to those who are in the areas, for the inconvenience they are experiencing,” Minister Liburd stated. He noted the recent frequent rainfall will not help to bring relief to the situation as the wells are underground and must be extracted via pumps. Spare parts are not readily available to repair the faulty pump as they have to be specially manufactured to fit the current system. An order was placed in October 2017, but has not been met as yet. However, on Sunday (February 11), WSD technicians substituted a “pump/motor combination” from another well into the Taylor’s well that supplies the impacted areas. The improvised system allows for 67 percent of the normal supply to flow to the areas bringing a measure of relief to residents. Technicians won’t have to depend on the temporary system for too long as the spare parts ordered last year are expected sometime next week.